Cartoonists, as Blankets author Craig Thompson notes at the beginning of Independents: A Guide for the Creative Spirit, are special people, and that can be taken to mean a lot of things, from exalted to, as Craig suggests, denoting a certain mental handicap. Once Hollywood is done digging through the used record bins for rise-and-fall success stories to make into music biopics, they might want to consider casting an eye to the mythology of comic book creators. American Splendor is only the tip of the iceberg. So far, the main outlet for cartoonist stories has been documentaries, from more high-end fare like Crumb to the cottage industry of Hero Video Productions, whose Telling Stories: The Comic Book Creators is almost like a rough model for Chris Brandt's Independents. 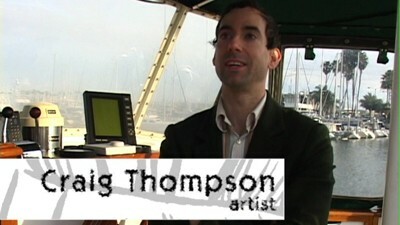 The two are similar in that both sit down comic book creators and get them talking about various aspects of the art form, and then they string together pieces of the interviews to make one long monologue about the creative process. In Telling Stories, the subjects are mainly writers who do mainstream superhero books; in Independents, Brandt's focus is individual creators and publishers who create their own books and forge a path in opposition to the superhero mainstream. I'm not going to pussyfoot around the fact that this is a subject that excites me very much. Indie comics are my bread and butter and have been for nearly fourteen years. I actually know a lot of the people interviewed in this documentary, and I even like a few of them. (Rim shot! Get used to that kind of sardonic humor, it runs rampant in comic book circles and rears its head a lot in Independents.) So, just on that basis alone, I was completely fascinated by Independents. I liked hearing creative personalities as disparate as Eric Powell (The Goon), Wendy Pini (Elfquest), Erik Larsen (Savage Dragon), and Gary Groth (publisher of Fantagraphics) talk about what drives them. The main quarry of Brandt's film is to discover two things: why create in the first place, and why choose comic books as a mode of expression. He even enlists cognitive psychologist Dr. James Kaufman to provide a kind of framework by discussing the science of the creative impulse in humorous interstitial sequences. The true backbone of the picture, though, are the artists themselves, who speak at length about why they do what they do, augmented with clips of their artwork. Naturally, interest amongst viewers may vary depending on your personal relationship with indie comic books. If the field is new to you, Brandt kind of throws you in the deep end, and you may be slightly lost in the first ten or fifteen minutes before the participants start to explain themselves. Once the ball is rolling, however, if you are at all curious about how artists of any kind go about chasing their passion, then the conversation should hook you in regardless of prior knowledge of this particular form. The movie should also intrigue you enough to want to go out and try at least a couple of these people's books. Really, if I have any complaint about Independents: A Guide for the Creative Spirit, besides its unwieldy title that inexplicably avoids using the word "comics," it's that there is an embarrassment of riches here. Too many interview subjects, too much talent, and the film doesn't have time to pause and examine any of them in depth. (And, hey, I know there are a lot of people already, but nobody even remotely connected to my publisher, Oni Press?!) If you're already a comic book fan, then even a partial list of interviewees (Kevin Eastman, Jim Woodring, Tony Millionaire, to name a few more) should be enough to send you out looking for this DVD. In any case, Independents deserves at least some kudos for sticking to the ethos of the artists it profiles. This is a very small production, and though there are some technical hiccups (why is the lettering in the onscreen credits and title cards so flickery? ), the overall production value with the animated artwork and staged scenes is quite good. I imagine Brandt's long personal quest to get this film done (I could judge some time frames by the change in Craig Thompson's hair, or the lack of change in Dark Horse editor Scott Allie's curly mop) was often as maddening and fraught with peril as the mission of the poor schlub sitting at a drawing table with a huge stack of paper, a few pens, and one hell of a good idea. 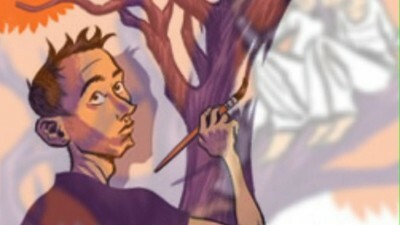 In that sense, Independents: A Guide for the Creative Spirit becomes exactly the type of thing it attempts to explore. 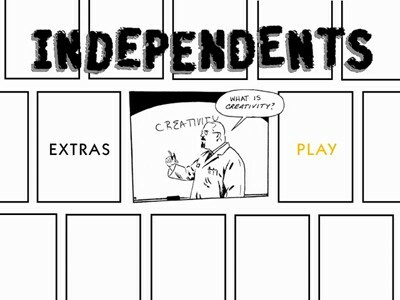 Independents: A Guide for the Creative Spirit is letterboxed at 16:9. A self-made production edited digitally, it moves from the computer bay to disc with little problem. Any flaws in the picture quality comes from the variables of shooting different people in public in different locales, mainly using one camera, rather than any flaws in the DVD authoring. On a technical side, I had problems with the menus. They were slow to navigate. When I would select something, it would take so long to load, I would think I hadn't actually selected my item. When watching the bonus features, when I tried to return to the extras menu while in the middle of a video piece, it sent me back to the main menu, and one of the times this happened it then would not let me back into the extras menu, it wouldn't let me do anything but start the movie until I shut my player down and reloaded the disc. It got a little annoying after a while, having to work my way back and forth. There is also no scene selection menu. The soundtrack is a very basic stereo mix, with no frills. None are really needed, though, as the audio is almost exclusively from people talking directly to the camera. Sure, barking dogs and office intercoms manage to make it into the final edit, but what are you gonna do? When an added audio element is inserted into the mix, such as music, it is properly integrated so as not to interfere with our ability to hear the speaker. Though Independents: A Guide for the Creative Spirit is only 77 minutes long, the DVD comes with more than 60 minutes of bonus material. Two different kinds of California comic book stores are profiled in short pieces: the more traditional The Comics Bug (5:00) and the more conceptual Secret Headquarters (3:00). There is also a text screen recommending a few books and videos about comic books for further exploration. In the trailers section, there is an old promo reel for Independents and a quick teaser for Chris Brandt's comedy short Closing Time. The deleted scenes and other bonus features are "less finished" than the finished product, and so expect to see quite a bit of artifacting and compression in this section. Independents: A Guide for the Creative Spirit is a documentary celebrating the artistic temperament as it pertains to creator-driven comic books. 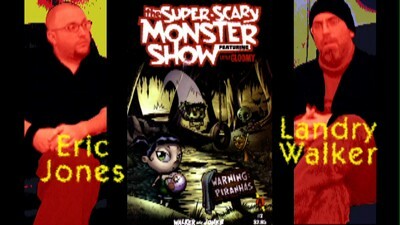 Bringing together a host of some of the best cartoonists the alternative comics scene has to offer, director Chris Brandt edits together their interviews into one cohesive discussion of why these people do the things they do and what the comics medium does for them. Though a low-budget production, Brandt rarely lets his lack of resources get in the way, and Independents should appeal to anyone who is curious about the spark of creation that gives the world so much of its entertainment and not just to comic book fans. Plus, the disc is packed with extras. Recommended.